Destructive aliens from Mars invade Earth. This film could be compared to "Earth vs. the Flying Saucers." Gene Barry (Burke's Law) gives an intense, overly emphatic performance. Ann Robinson (Dragnet), as a beautiful Library Science teacher from USC, provides the required love interest. 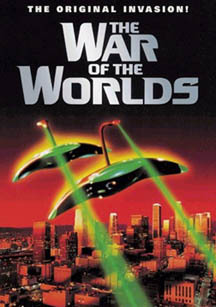 The FX, including alien war machines and disintegration rays, are excellent. The cast includes: Gene Barry, Les Tremayne, Ann Robinson, Lewis Martin, and Cedric Hardwicke.